City of Peterborough Swimming Club (COPS) completed a Fenland League double at the weekend. The COPS A team won the league title and the cup final after taking the honours in the final meeting of the season at the Geoff Moulder Leisure complex in Boston. In the early stages an upset looked to be on the cards as the COPS B team set the pace. Ten year-old Toby Norman led the way for COPS B with a win in the boys 100m individual medley and then Katie Tasker (12) won the female event and the 50m freestyle. More COPS B wins followed as Matthew Rothwell (13) won the 50m breaststroke, Dominic Restaino (9) the 25m fly, Lewis Flower (11) the 50m freestyle, Thomas Bromley (12) the 50m breaststroke and Briony Burmby (11) the 50m backstroke. 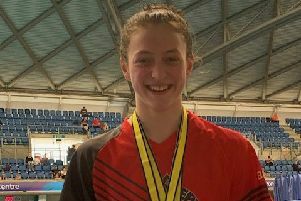 Other COPS B swimmers to beat their A team compatriots were: Lauren Browne (12) - 13/u 50m back (2nd), Lewis Flower - 50m fly (3rd), Hannah Jakeman (11) - 50m free (3rd), Ella McGhie (11) -11yrs and 12yrs 50m fly (3rd in both events) and Toby Norman – 13/u 50m back (3rd). COPS A, however, recovered from their slow start and were duly crowned league and cup winners. Winners for COPS A were: Olivia Bearman-Skipworth (9) – 10/u 50m breaststroke, Stella Blakeley (11) – 13/u 200m individual medley, Jack Brown (12) – 13/u 50m free, Georgie Chappell (12) – 13/u free, Laura Fherenbach (10) – 12/u back, Erivan Hamid (10) – 50m back, Daniel Kalish (9) - 50m free, Joshua Martin (9) – 10/u 50m free, Amy Paget (9) – 25m fly, 10/u 50m back, 50m breaststroke, 10/u 50m fly, Millie Ryan (10) – 50m free, Stan Scarborough (9) – 50m breaststroke, 50m back, Joshua Spencer (10) – 50m breaststroke, Mia Turvey (9) - 50m free and Eve Wright (12) – 13/u 50m breastroke. Going into the final event COPS A had pulled out a 17-point lead over Boston. With flags waving and to a cacophony of sound from air-horns and vuvuzelas the 8x25m freestyle team of Josh Martin, Millie Ryan, Mark Goodes (11), Chloe Elliott (11), George Whiteman (10), Sophie Galjaard (12), Jack Brown and Georgie Chappell took the final honours to seal the league and cup double win. Also swimming for COPS A were: Lily Borgognoni (11), Harley Brown (9), Fabien Brudnicki (11), Cameron Fisher (12), Lili Griffiths (11), Kate Mcloughlin (12), Matthew Newson (12), Bert Papworth(10), Oskar Rajski (11), James Rothwell (11), Connor Walker (11). Also swimming for COPS B were: Eleanor Byrne (10), Joel Coulson (10), Lucie Creedon (9), Matthew Cussell (13), Holly Graves (11), Kieran Griffin (9), Emily Macfarlane (9), Oliver Macfarlane (11), Daniel Moyses (9), Harriet Salisbury (10), Kieran Underwood (10) and Isobel York-Forward (10). Final result: COPS A 166 points, Boston 149 points, Wisbech 131 points, COPS B 129 points, Deepings 89 points.